Running and training for the Comrades – The Ultimate Human Race…is a dream full of pain, sweaty tears and die hard commitment- is what I gather from all the people I see on Social Media. And every year very few make it to that road that leaves many of us with visions of victory over every kind of adversity a runner could face. I wanted to do a story of such a race on my blog and found a spark by the name of Anjali Saraogi. 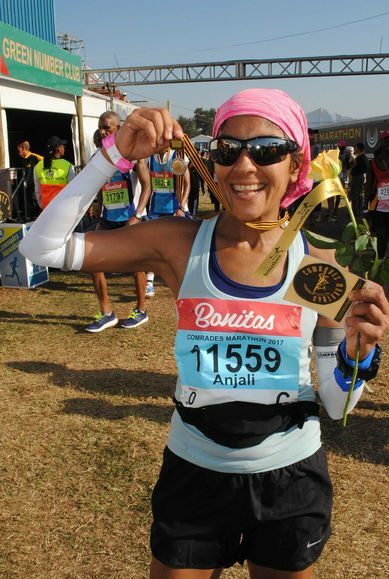 What leaves me in awe of Anjali is that she started running in 2015…went for her first Comrades run this year and smashed it in sub 9 hours. The race is tough. But I am tougher. Nothing is impossible. I am Anjali Saraogi, age 43years, from Kolkata. I started running marathons in November 2015, when I ran my first Half Marathon in a time of 1 hour 55 minutes. This inspired me to push myself and set higher goals. I set a lofty target of achieving a Boston Qualification time in my first Full Marathon. Hardwork, commitment and dedication towards my goal paid off and I smashed my BQ time by nearly 13 minutes, in the Bank of America Chicago Marathon 2016. This encouraged me to aim higher and strive for more. Fortunately, I happened to read a book, “Dare to Run” by Amit Sheth. The courage, dedication and determination reflected in the book inspired me to register for the Comrades 2017, the Ultimate Human Race. I also decided that I wanted to challenge myself further by aiming for a Bill Rowan Medal, for which I had to finish the race in less than 9 hours. I truly believe that the body achieves what the mind believes. I also knew that the training would be hard, but hard is not impossible. I realized that training for an uphill run in Kolkata would be very challenging, since Kolkata is extremely flat. But where there is a will, there is a way. I don’t need external motivation to drive me towards my goals. I found a reliable training plan on the Internet and followed it with dedication and focus. I trained on my own, devising strategies in nutrition, hydration and pacing, which worked for me, with trial and error. I did suffer injuries and setbacks, extreme fatigue and pain, and there were moments when I just wanted to give up. I knew my body could stand almost anything, it was my mind that I had to convince. Relentless labor and sacrifice are a prerequisite for any achievement. I started training post SCMM, in February 2017. I was fortunate enough to be able to travel out of Kolkata for my 3 long runs. Every blessing counts. The target for my first long run was 54km. Since I had never run more than 42km, I nearly gave up and my last few km were a painful walk and eventually, a crawl. I was not discouraged in the least. Infact, I felt a hunger to improve and strengthen myself. My second long run had a target of 60 km. Again I failed. I ran strong till 50 km and then jogged and walked for 8 km, with multiple breaks, when I finally gave up at 58 km. I had not reached my target but I was not upset. I could only see that I had improved since my previous long run. My third long run of 60km was on 30th April. On this run, not only did I manage to run my target distance but I managed to run at race pace, comfortably and strong. After all, there are no elevators to success, you have to take the stairs! I was confident, happy and optimistic, when I stood at the start line of Comrades 2017. Even though the outcome of the race was not in my control, I was excited and grateful to be standing there, hearing ‘Chariots of Fire’, in the electrifying atmosphere. Luck was on my side. I achieved my target of a Bill Rowan Medal with a time of 8 hours 38 minutes 23 seconds. I had a strong finish and an incredible experience. Running this race was probably the most difficult thing I had ever done in my life and I had enjoyed every moment of it. I strongly feel that most women undermine their capabilities and are reluctant to expand their limits. Our fears are our greatest limits. We spend more time living our fears than our dreams. Doubt kills more dreams than failure ever will. And if you ever ask yourself, ‘Can I give more”? The answer usually is ‘Yes’. Superb I always knew Anjali that you had that spark. It was just a matter of time before the world saw it Well done and keep at it !! Congrats Mam. I would like to read the book “Dare to run”. Anything is not easy but everything is possible Mam…. Anjali – Well deserved medal. Great effort and determination. Congratulations Anjali!! !I recall our conversation on the subject of my barefeet at the start of our Delhi HM!! When I saw you flying on the course I recall telling a friend of mine; watch out for Anjali, she’s a natural! To me a ‘natural’ in running is someone with such fine faculties of the mind that they can exhort their body to do the impossible!!! You are indeed, a natural!!!! Great. Highly motivating.This blog makes you impatient to start running. Keep it up.